﻿Donovan Philip Leitch may well share a proletarian origin with several of the folk bards of his time. But comparisons with the top dog Dylan have worn thin and are not worth the effort since Donovan never was neither vocally nor thematically brusque – and moreover he created his own standards. He quickly converted the pacifist message of "The Universal Soldier" into positive thoughts and his poetry was concerned with history, sagas, myths and magic. »Lord, kiss me once more, fill me with song« he prays in "Wear Your Love Like Heaven", and if this makes you sentimental then you are on the right wavelength. 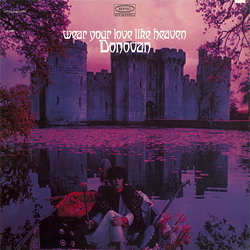 However, the »seller of hope« (Donovan on Donovan) triggers off a few psychedelic nerve tracts: whether it be a personal experience in echo form ("Sun") or the 'sprechgesang' and whistling of a vocal group ("Little Boy In Corduroy") – light, gentle but perceptibly formed. That Donovan set far more than cheerful texts to the guitar is proven by the use of sawing stationary sound of the organ, low-register string passages and subtle rhythms, which raises his song repertoire miles above routine. A nice 'folksy guy' who merely loves the sun, moon and stars just cannot exist in times of war.